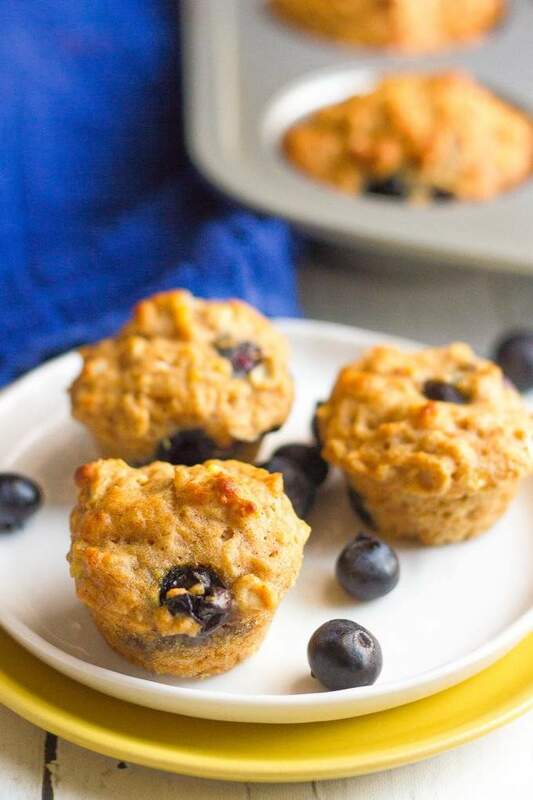 These whole grain, naturally sweetened banana blueberry muffins are creamy, moist and bursting with fresh fruit flavor! I’ve got a choose-your-own-adventure recipe for you today. If you haven’t noticed, I’ve got some serious muffin munchkins in my house. We have muffins at breakfast, snack, school lunch, sometimes even a savory variety for dinner. There was a time, when M was a toddler, that I could get her to eat anything if it came in muffin form. I whipped up some seriously crazy concoctions and she took them down! J, my little boy, has followed suit and loves pretty much anything I serve in muffin form. And if you think muffins can be unhealthy, well, you’re right. But not done my way. 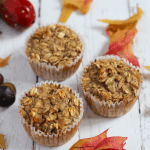 My muffins are always whole wheat/whole grain and mostly naturally sweetened – just like these ones are. I even have lots of options that are made without butter or oil for a super light indulgence. Given our muffin craze, I made you a whole muffin category so you can share in the fun! Check it out! 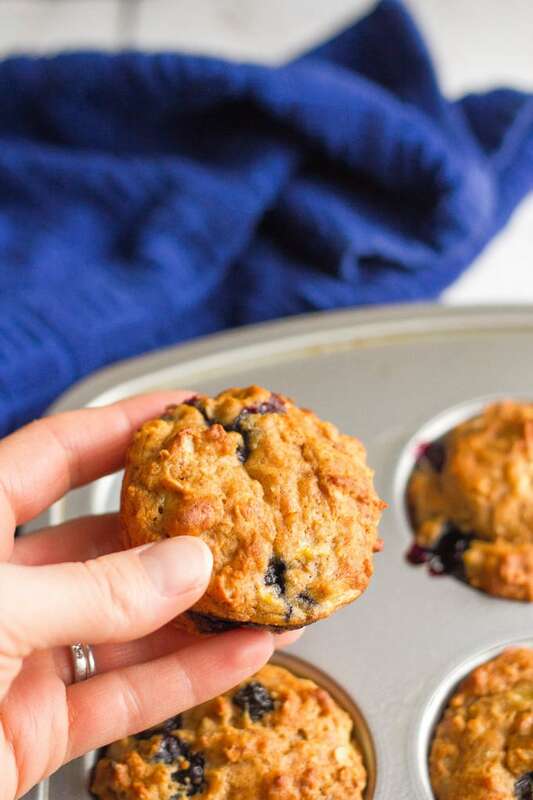 And then whip up a batch of these light, bright banana blueberry muffins because they are seriously tasty. 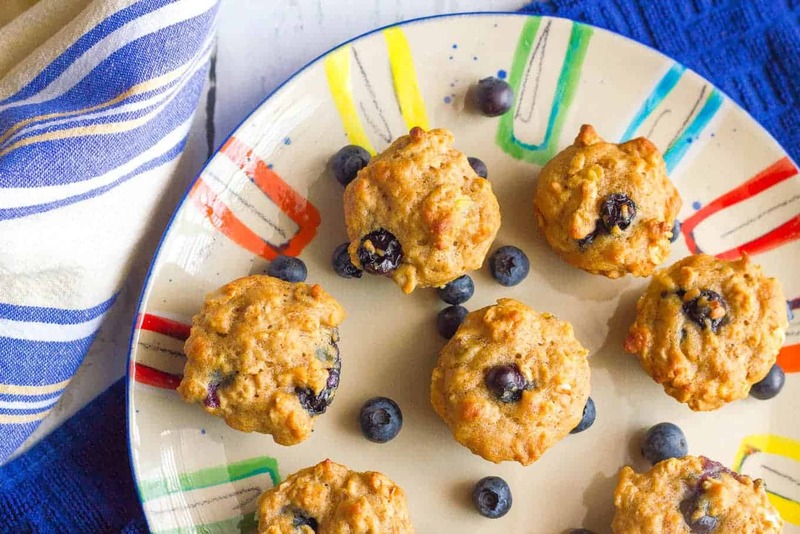 Full of fresh fruit and tangy Greek yogurt, these muffins are perfect for breakfast time or an afternoon pick-me-up. And the extras freeze beautifully, so you can stash some away in your freezer for busy mornings. I love when breakfast is already made for me! P.S. I’m headed out for spring break with my family this weekend. (We will be beaching it up in Florida with my in-laws and I am SO excited!) But don’t worry, I have plenty of deliciousness planned for you so you won’t go hungry. And I have plenty of food packed for us — including a baggie of these muffins — so we’ll be all set on vacation, too. Happy spring, friends! 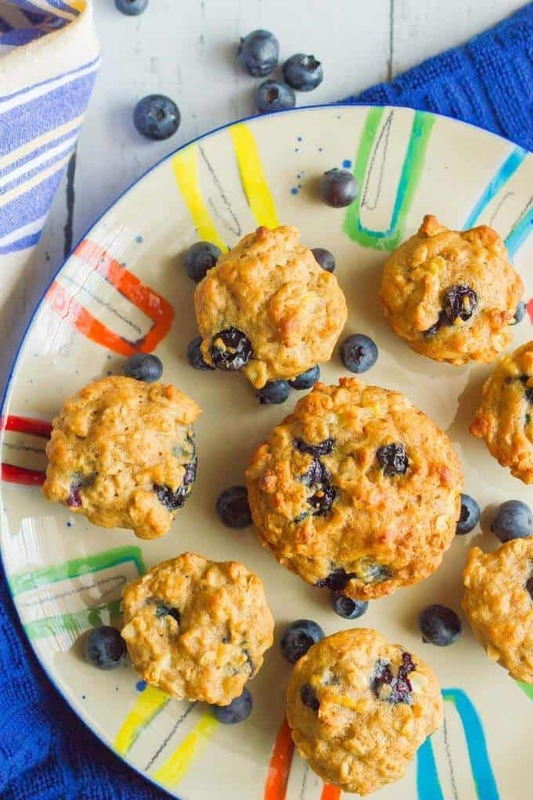 Whole grain banana blueberry muffins just bursting with fresh fruit flavor! Preheat the oven to 375. Prepare muffin tins (see notes). Mash the bananas in a medium bowl. Add Greek yogurt, honey, oil and vanilla and stir well to combine. In a large bowl, combine the flour, oats, baking powder, cinnamon, baking soda and salt. Fold in the blueberries gently, so you don’t break them. Be careful not to overmix the batter. Bake at 375 for 9-10 minutes for mini muffins or for 18-20 minutes for regular-sized muffins. Let cool for a couple of minutes in the pan, then remove and cool completely. Extras can be kept in the refrigerator for up to 5 days or stored in the freezer for up to 3 months. Spray the mini muffin tins with cooking spray or line regular-size muffin tins with muffin liners. I like making both sizes of these muffins - and my kids are fans of both! You can make 24 mini muffins and 9 large muffins or 18 mini muffins and 12 large muffins. Or you can do all of one size or the other — you’ll get about 42-44 mini muffins or about 18-20 regular muffins. Kids are so funny! Who knows how they decide what they will or won’t eat! I’m with your kids on these muffins though. They sound like a delicious pick-me-up to have with my afternoon coffee and I would definitely enjoy a fruity muffin for breakfast! Safe travels! I’m sorry, it’s not clear for me how much joghurt should we put in this recipe. 3/4 of? A cup? In ml that it would be? !… I really want to try it for my son, they sound healthy and tastefull. My compliments! Hi Anca! Yes – 3/4 of a cup. Sorry for the confusion – I’ll update the recipe now. Hope you enjoy them! I love to eat muffins at all different times of the day as well. I also love how used healthier and more wholesome ingredients in these! They look absolutely delicious! Ooh, these look right up my alley! The muffin combinations that come out of your kitchen are always seriously delectable, Kathryn, and so healthy. It looks like these ones are a perfect ‘best of both worlds’ kind of hybrid for those days when you just can’t choose between banana and blueberry. Sounds great to me! 🙂 Wishing you a lovely weekend! Great combination of blueberries and banana. I actually love baking with bananas, they add so much moisture to the baked goodies. Pinning! Thanks Ilona! Yes they do! Bananas are such a great, healthy way to add sweetness and moisture to baking! My little one is crazy about muffins as well :). I need to try these next! Your children are very smart because I’d eat everything in a muffin form too! We always have so many ripe bananas lying around and need a different recipe than my normal banana bread. Trying this next time. Yum! These are right up my alley. Love the coconut oil sub. Thanks Julie! They make a great easy breakfast or snack! This recipe looks delicious! I love the fresh, plump blueberries in the muffins! Thanks! 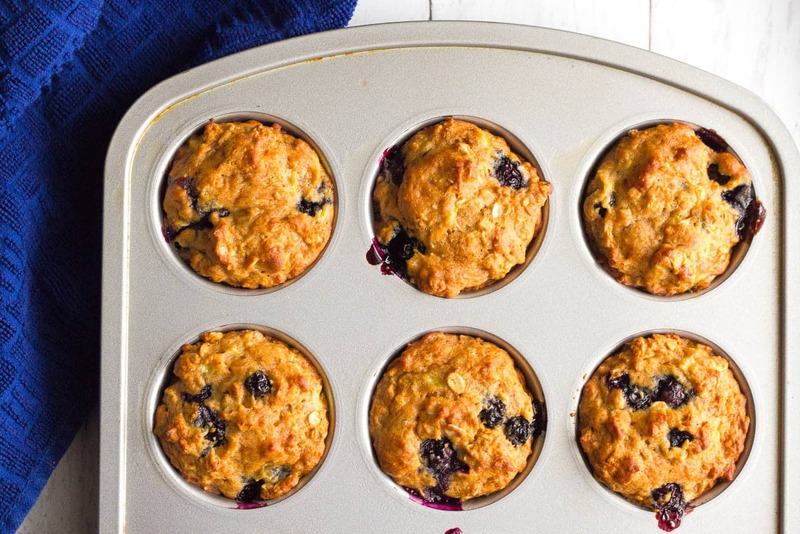 The blueberries make the muffins so juicy and delicious! These muffins are making me HUNGRY !! Yes, they are perfect for tea time!! 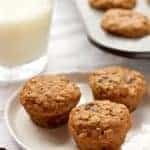 Mmmm I love healthier muffin recipes like this! These were a Friday afternoon win. It’s a good recipe to make with a little person’s help. I substituted applesauce for the oil. They were awesome. Yay, I’m so happy to hear that Jenny! Thanks for letting me know 🙂 Have a wonderful weekend! I made these this morning with fresh strawberries instead of blueberries, as a way to use up the massive amounts of strawberries we acquired picking yesterday. Cooking time took slightly longer, since the cut berries added more moisture, but they are AMAZING. Highly recommend trying. Next up: your strawberry oat bread. Excellent! 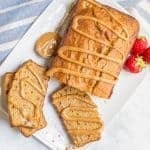 So glad to hear it 🙂 If you have a strawberry overload, definitely try my freezer strawberry jam too- no canning required and it’s naturally sweetened with honey – http://www.familyfoodonthetable.com/strawberry-freezer-jam/ Have a wonderful Sunday! I love banana and love muffin too. <3 Look at your muffins, they are so delicious and can't wait to try eat them :d Sooooo good. Thanks Emily! I hope you love them! Hi, yes, that’s the correct amount of vanilla for the full recipe, which makes a lot of muffins! It’s almost a double recipe so that might be why it seems like a lot of vanilla. I hope you try them!